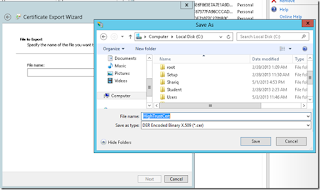 ADFS 3.0 server is ready with realm set to SharePoint. 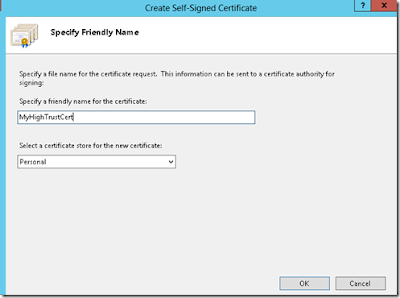 ADFS is registered with SharePoint as a trusted identity provider. Server is ready for hosting asp.net provider hosted app. 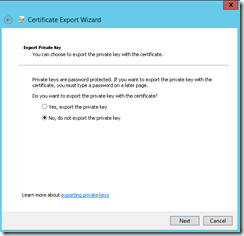 Certificate is available in private, public part along with password. In the development environment you can use a self-signed certificate, but you would need a commercial certificate when you publish your Apps to store. So we will create a self-signed one. 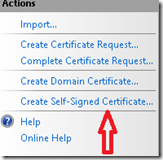 In the IIS manager, click on Server Certificates. 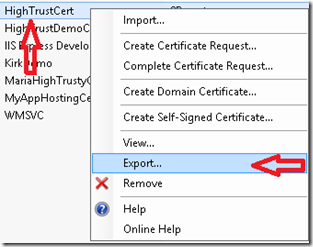 Enter some meaningful name like HighTrustCert and Click on Ok.
Next, double click on the Certificate in IIS. Click on Details tab and click on Copy to File. 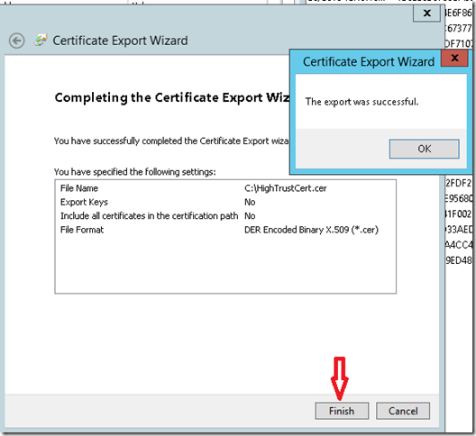 Now you should see the Certificate Export Wizard (remember earlier we exported the .pfx file). The first screen elucidate the significance of what we are doing. Keep Clicking Next across the three screens. Below screenshots demonstrate the same. I keep all the default options. 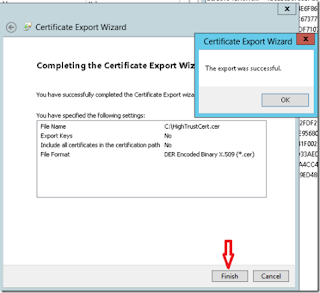 Just one thing to mark that now we are now exporting the .cer file. I choose the same location. Click on Save. Run SharePoint 2013 Management Shell as administrator. First thing first, you need an Issuer ID. An important point, it has to be Lowercase only. Run the below PowerShell cmdlets to create trusted security token service. 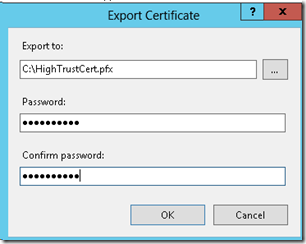 IsTrustBroker: this flag ensures that you can use the same certificate for other apps as well. If you don’t include this, you might receive “The issuer of the token is not a trusted issuer" error. This will create a new MVC project. Now Visual studio created two projects with in the same solution. 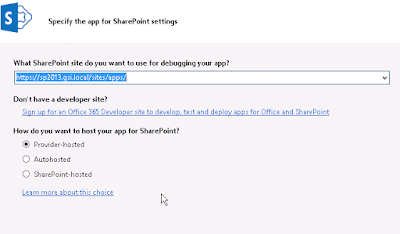 MVCApp1 is the SharePoint App and MVCApp1Web is the remote webapp. 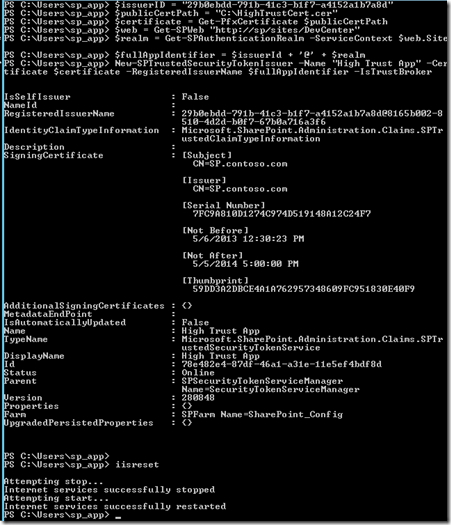 Only artifact of the MVCApp1 is the appmanifest.xml. This is similar to what feature.xml to WSP. We provide the version, permission and startpage details of the app. 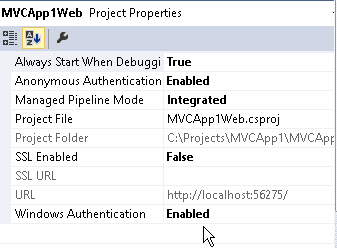 Make sure Windows authentication is enabled for web project, and check other settings as well. 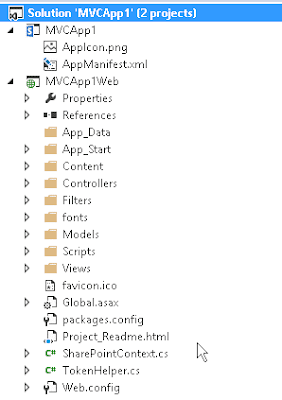 Now you can directly debug the app by pressing f5. 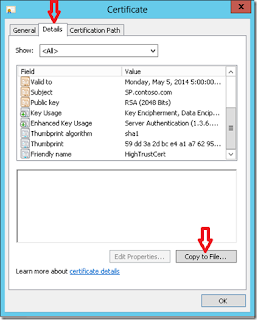 Now login to app using your windows credentials and trust the app. 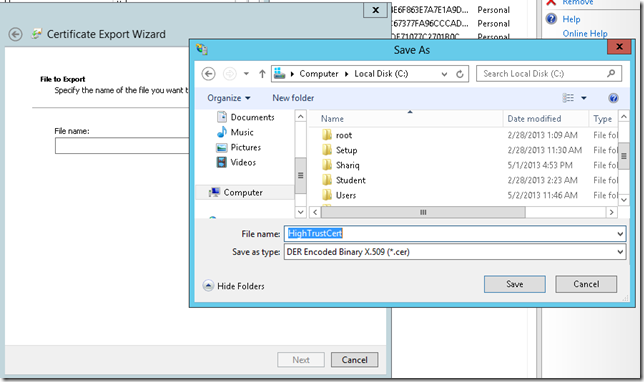 This will lead to sample app hosted from VS2013 if all the settings are right. 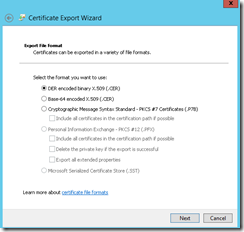 Copy the Personal Information Exchange (.pfx) and published files into the app catalog server. 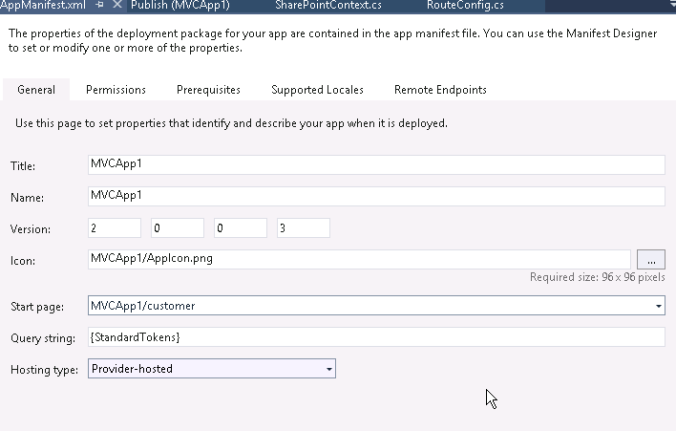 Enable the required features (refer the below screenshot) through “Add Roles and Features” in Server Manager. 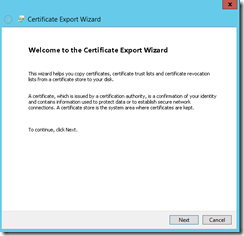 Import the Certificate, IIS -> Server Certificates -> then click “Import” link in the right top. 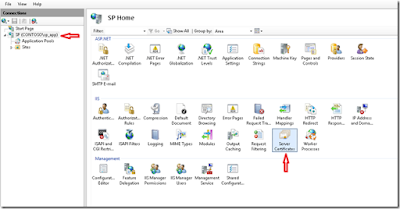 Create a Website in IIS. Right click in “Sites” then choose “Add Website”. In the “Add Website” window, enter the proper site name, select the physical path (C:\inetpub\wwwroot\eBizApps) and then click “OK” button. Select the site name (ex. 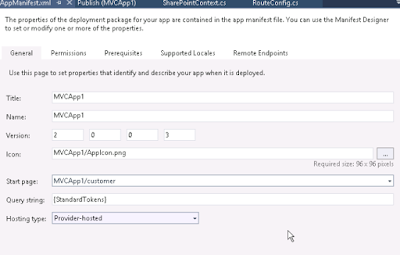 eBizApps), click the “Bindings” link in right side. Browse this site using Internet Explorer. The site will open. The App Domain is the domain name set on the remote web application server’s IIS Site that will be hosting this app. 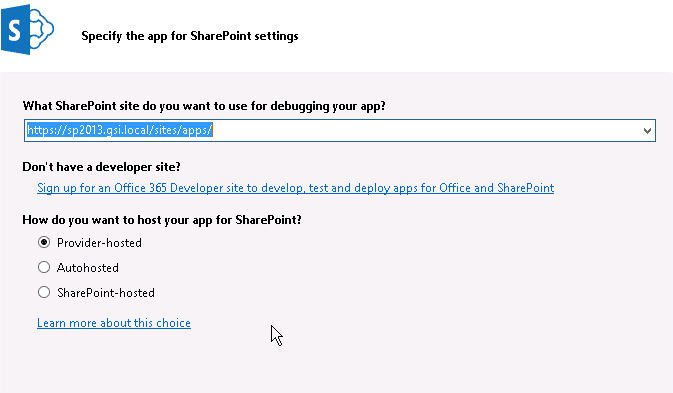 Access a team site and selected site contents and clicked Add App. Click on it and click Trust It . Note: If it errors on this step and you’re logged in as the system account, try again using a non-system account. After install, test by clicking on the app.